Most of us have our favorite big name tube amps. We may not own them, but there's at least one that most of us would not turn down if given a too good to pass up deal. The page-1 tube amp brands on most sites consist of Fender-Marshall-Vox-Peavey entries with maybe a low budget big boy or two thrown in. Some of them deserve to be page-1 entries. Others, well, maybe not. What are those relatively unknown little secrets of the amp world? What are your favorite non-big name tube amps? No price limit, but please consider sub-$1,000 units for this informal poll. Feel free to make expensive and more reasonable entries as they are oft-times different breeds. I have heard great things about those Jet Citys!! I havent played one yet, but I would like to one day. The Bugera amps are prety awesome for the price also!!! I gotta say I played through a Marshall Class5 the other week.... some times the big guys are big becouse they get it right!!! s1120 wrote: some times the big guys are big becouse they get it right!!! I've got a similar feeling about my Fender Blues Deluxe Re-Issue. Gotta love that BD! It might have been the deal of the century (to date, ha ha). I love my remaining La Brea BD too much and only sold the other (MIM) to share the pure joy with a bud, who just happened to have the money! Seriously, he knew I had it, or 2 actually, and wanted it. He's still in love with it of course, takes it out and continues to make disciples of the people who hear it, use it too - yep, he shares! What's not to love about that? I like my little Danelectro Nifty Fifty, but I don't think they make them now. I've mentioned that I use my Roland Cube 20X daily, and I have another surprise, not shared to this date. I bought a KORG micro synthesizer last month and run it through the Roland. I am so totally satisfied with that charming Roland, that it looks like it is going to be the definition of whatever I am as a musician. Other colleagues, teacher and high school students are using a small Kustom SS here, and I always liked them. I have sort of liked Traynor, as I had one or two in the past (yes I remember 2 big, heavy ones!) in the past when they were fully Canadian. Then I talked to Pete Traynor, the founder (when he was alive) about the new ones. It was sad, I won't go there, but let people judge whether they have been reliable of not. IDK... China, Indonesia, Taiwan, I didn't notice. I only saw that they weren't for me. If the reliability improves, I could recommend them for anybody - as a tube amp! In that same category, Randall is there, but needs a little clean up of their performance record (IMO - personal experience) to be a solid player. And there is potential there, I like them as well. If I can still be brief, and also frank about it, once you own a bunch of Fender tube amps, it is hard to get excited about a Peavey in the same category. I still believe in Peavey amps and support many others with them, but I prefer the Fenders for myself. We all get what we get - it's our money, right? Not trying to offend anyone, but I believe that Fenders are the original, since 1946, and Peavey came later. I have had several Peavey SS amps, probably as many as I have had Fender SS amps, in the total range of 40 or so, not too sure. The majority were sold because the buyers saw or heard the things working, as well as being all pretty and shiny, and they were willing to buy them out from under me. Still, my son relies upon and will always have his awesome workhorse Peavey KB-300 for his big synths and for thumping bass. From the 80's! : " If you need the ultimate in portable keyboard amplification, this is it! This Peavey KB-300 Keyboard Amplification System has 150 watts RMS, 3 channels c/w tone & volume controls, FX loop, equipped with industrial quality dolly wheels." My boy (who is a man, ha ha) also swears by his venerable Peavey Bandit 112, and I believe he'll be happy for life with it as well as having my 1989 Fender Super 60, which is a bit like a Mesa IMO, for all his guitar needs. The Bandit may be the most common and long lasting of Peavey's? He researched it, tried many others, then we just had to go out and pick among the used ones. Of couse I am really tempted by many Mesa Boogie models (oohh leather-covered Lonestar! ), but since I have no complaints with my current stuff, and no money these days, I don't need to go there at all. Thank you Leo Fender for saving me from that expense and worry? Tube amps ...... not my Peaveys? I have 3 Peaveys. I have a couple of Epiphones I like I suppose. My Valve Junior Half Stack and a Valve Special, but my Peaveys are my favorites. Only one of them is a made in USA higher priced amp though. My Classic 30. I have a 50 watt Valve King and a 100 watt Windsor head. I keep eyeballing those Jet City amps though. TRGuitar wrote: Tube amps ...... not my Peaveys? I have 3 Peaveys. I have a couple of Epiphones I like I suppose. My Valve Junior Half Stack and a Valve Special, but my Peaveys are my favorites. Only one of them is a made in USA higher priced amp though. My Classic 30. I have a 50 watt Valve King and a 100 watt Windsor head. I keep eyeballing those Jet City amps though. Yeah, I know and that's why I said no offense, like my son has his Peaveys too and I once had many. Sorry, topic is tube amps. I decided on Fender based on their history in addition to totally satisfactory performance, tonal characteristics and varieties, and I'd probably say no to Mesa Boogie now (I have declined to buy before) just because I'm into the brand name thing, and Leo Started working with his amps 65 years ago. It then became history or legend, something like that. I buy that? Peavey, Mesa and many others have a very honorable mention in my books, and are great products for many people in the future. Part of me just has been there and done that. Also, I've had Marshalls, naturally, and decided that they just aren't my sound. Everybody else likes Peaveys, just like I like Fender. I overhear comments in bars and at shows, where people remark at the equipment's names and logos, and they sure do like Peavey. 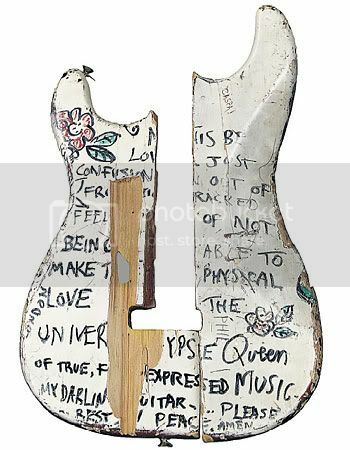 I sense that others like Fender guitars alot too, due to their ubiquitousness with the "giraffe's nose" headstock. I forgot to say, that I really like Crate, very, very much from Buddy L or whatever they call themselves (I have done business with their company) http://en.wikipedia.org/wiki/Crate_Amplifiers except my early Crate model was the only amp that I ever really blew up and set fire to, and it was not repairable. I used to support the Ahed Corporation of Toronto, and their Darius amps and P.A. 's during the 70's. They were indestructible, like those Canadian Traynors! And I think Carvins are really good & cool. Some of my best friends are enjoying their gear too. My Peaveys are all tube amps and I have owned Marshalls in the past. I like the sound of the Peaveys. TRGuitar wrote: My Peaveys are all tube amps and I have owned Marshalls in the past. I like the sound of the Peaveys. Back in the day when I was younger..[early 80's] It seemed that all the guys that played out were looking for peaveys. Back then I realy did not pay attention to what they were, or how they sounded like [frankly... all garage band iron maidan sounds the same whatever you play it on. ] So i dont know if itsthat they were more affordable for the young guys, held up well, or what.. but they all had/wanted them it seems. Would really like to get another for a backup. Except, it doesn't have the same tube compliment that the Maggie it's based on has. So, it's sort of a cross between a Maggie and an old, Blue Diamond Ampeg, sonically speaking - At least IMO. Other than that, I think I'm a Fender tube amp fan. I base my amp likes on how they sound clean, and Fender is pretty hard to touch in that dept. I know you said, "BIG NAME", but Fender Brown Face amps are wonderful.... And hard to find. Could we include rare Fenders in this? Ever see/hear Jimi at Monterey? Lovely tone there. That was early in his career (First U.S. appearance). He lost that sweet tone later on. Cos later he played thru the Marshall Wall. At Monterey, he had one Marshall Stack and Two Fender piggy backs (Thinking they were Dual Showman's). I'm going for the budget model here: I absolutely love my Laney Cub 10. It's a very cheap tube amp, but amazing for the money. Use a few pedals for all the effects you like and it sounds unbelievable. Speaking of old Maggies - How about the Evil Robot Amps? rparker wrote: What are those relatively unknown little secrets of the amp world? Thanks to all who participated in the intended spirit, topic and purpose of this thread. It was nice to hear about some of the non-mainstream models out there. I hear so very little about some of these gems. I see one advertised once in a while on Craig's List or something and I often wonder how good or bad are they. All's you got sometimes is a bad video mic sometimes. Ken, is the amp you posted at that guitar shop the one you stumbled out of a used place for something like $350? I have seen a trend recently on the CL. The bigger amps are not selling as fast as their smaller bothers and sisters. I've seen some Fender Blues Deluxe Reissues, HRDs or even Devilles in good shape stay on for weeks for 1/2 of what they were new. The smaller jobs, like the Blues Junior, seem to stay on for a week or two at the most unless they are priced out at 85% retail. Conversely, the little known ones seem to stay on CL for weeks no matter the price, large or small. I've even seen them posted from regions over two hours away and for very fair prices. The whole big name brand is king thing. EBS. Mainly it is brand for bass players. Mine is the Classic Session 60, it is solid state but the brand also has tube amps. It has an absolutely clear sound. I also play my guitar thought this amp and sound pretty good (after play with the tone controls). You can get a nice "rounded" tone. "Ken, is the amp you posted at that guitar shop the one you stumbled out of a used place for something like $350?" Yep, sure is. My amp is the same as the one I posted.... Same condition too. Think it was tagged for $650.00, and I walked out of there with it for $250.00 flat. How about the Tweed Champ? Well, I'm not sure about this info (please correct me if I'm wrong), but I'm pretty sure that EC recorded the entire Layla Album on a 56 Strat and a couple wide panel tweed Champs. Also think that Joe Walsh recorded lots of the James Gang on a Tele and a Tweed Champ. Thinkin' I saw somewhere long ago that Billy Gibbons got that HEAVENLY tone from a tweed Champ and.... a STRAT!